Cosy nights in are perfect for creating and with help from these free project ideas you can start making straight away! Create a jar label for your homemade goodies, make one-of-a-kind autumn inspired gift wrap, tag or autumn card. 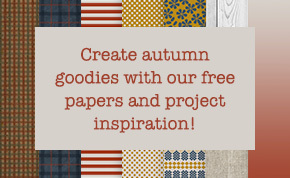 Use our FREE autumn paper downloads which include wool and wood effect, floral, spots and many more to create your autumn projects. Top off your project with a sentiment such as ‘rain, tea and a good book’, ‘hello autumn’ or ‘please snuggle’. These are free for you to download today, simply enter your email address in the box, this will also sign you up to the Sizzix newsletter so you can be the first to hear the latest news, views and more! чудесни за есенните ви проекти. Можете да ги свалите ето от тук. Нужно е само да въведете своя имейл адрес. Хубав ден ви желая и много есенни вдъхновения!